This poem by Bashō begins the “Afterward” to Diane Durston’s guidebook to the ancient capital city of Kyoto. I believe it’s a fitting epigraph, as this book obviously wasn’t written for tourists. Even though it occasionally attempts to make provisions for day trippers or overnight guests who only speak a small amount of Japanese, I wouldn’t recommend this book to a casual traveler. To those of you who have lived in Kyoto but have since returned home, I would offer another epigraph: Ignorance is bliss. I spent a year in Kyoto three years ago, and for me this book doesn’t evoke nostalgia as much as it inspires regret. The sembe store right next to the Starbucks. The bamboo weaver’s studio on the way to McDonald’s. The famous ramen stand right next to the movie theater. All the secrets and culture and history that I just didn’t see. If you still live in Kyoto, or if you’re planning on living in Kyoto, or if you’re never, ever going to even visit Kyoto, this is a wonderful book. If you’ve had your chance and can’t go back, or can only spend a day or two, I’d think twice before tempting yourself with Old Kyoto. One of the nice things about this book, however, is that it’s not simply a travel guide. 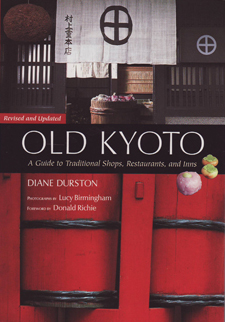 Durston has divided the book into sections of the city (central, east, north, west, and south) and divided each section into shop, restaurant, and ryokan listings. Each listing is fairly long (three pages), so Durston has plenty of space to explain what’s interesting about the particular location. If a certain ryokan is one of the most exclusive hotels in all of Japan, Durston is going to tell you what’s so amazing about it. If the owner of a particular restaurant has a strong personality, she’s going to tell you about what a character he is. If a craftsman’s shop has been in business for hundreds of years, she’s going to tell you about the shop’s history. If a ceramic dealer specializes in tanuki statues, she’s going to tell you all about the tanuki culture in Japan. Durston is supremely knowledgeable, yet always humble and engaging. Moreover, I think she has written a wonderful essay on the history of Kyoto, which serves as an introduction to the book. Old Kyoto is so interesting and so well-written that I believe it’s something that should be read cover to cover. The numerous photographs that accompany each entry, although printed in black and white, are a lovely bonus. For anyone who enjoys reading about Japan, or for anyone who enjoys reading good travel writing, I highly recommend this book. Get it before it goes out of print again!